Breezy Basix 2 Self-Propelled Adjustable Wheelchair. The Breezy Basix 2 is anything but basic. Although the design is clean and lean, it doesn't lack adjustability or functionality. It boasts a tension-adjustable backrest and a cleverly designed, strong castor attachment (0, 3°, & 6°) for impressive stability. The centre of gravity can be adjusted via the axel plate. 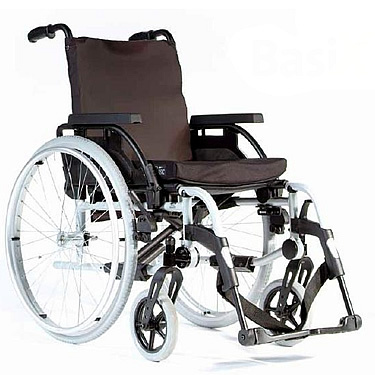 Although performance engineered, a Breezy Basix wheelchair weighs in around 15kg (32lbs). The adjustability, coupled with the right padding and upholstery, makes it a very comfortable choice too.